JSF Tools are especially designed to support JSF and JSF-related technologies. JSF Tools provide extensible tools for building JSF-based applications as well as adding JSF capabilities to existing web projects, importing JSF projects and choosing any JSF implementation while developing JSF application. This guide provides the information on JSF tooling you need to allow you to quickly develop JSF applications with far fewer errors. The table below lists the functionality provided by the JSF Tools. 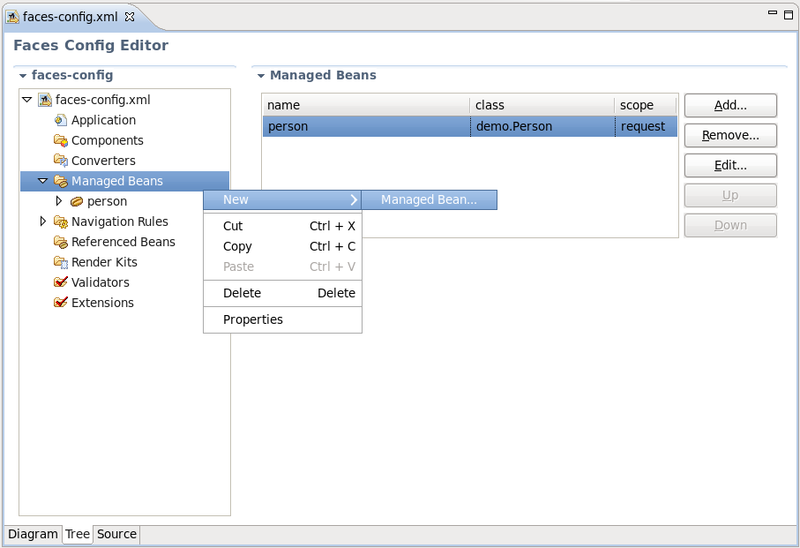 All JBoss Developer Studio and JBoss Tools release documentation can be found on the RedHat Documentation website. Nightly documentation builds are available at http://download.jboss.org/jbosstools/nightly-docs. JSF Tools does not lock you into any one JavaServer Faces implementation. You can always specify the desired JavaServer Faces implementation while creating a new JSF project (see Section 3.1, “Creating a New JSF Project”), adding JSF capability to any existing Eclipse project (see Section 3.3, “Adding JSF Capability to Any Existing Project”), or importing existing JSF projects (see Section 3.2, “Importing Existing JSF Projects with Any Structure”). At this point the special wizard will prompt you to specify an appropriate JSF environment. It may be JSF 1.1.02 RI, JSF 1.2 or JSF 2.0. 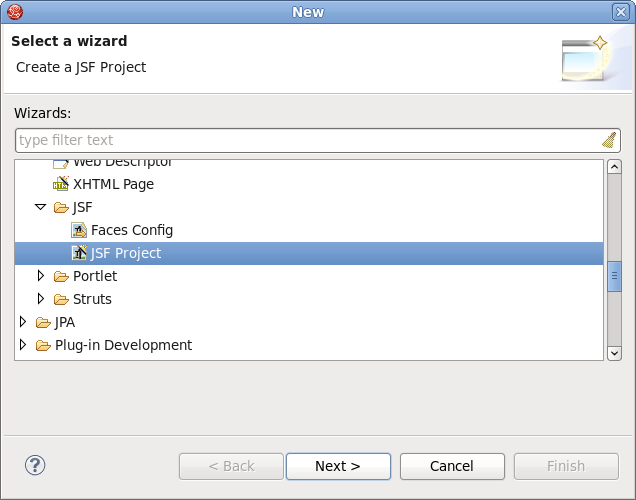 The wizard also lets you select JSF implementation with a component orientation such as JSF 1.2 with Facelets or MyFaces 1.1.4. After specifying an appropriate JSF environment, all the required libraries associated with the selected version will be added to your project. In this section we will focus all the concepts that relate to working with Facelets. Facelets extend JavaServer Faces by providing a lightweight framework that radically simplifies the design of JSF presentation pages. Facelets can be used in a variety of ways that we will consider further in this section. 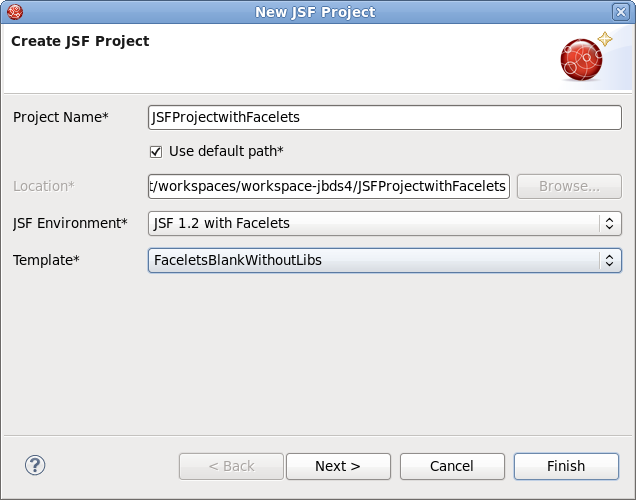 If you want to build an application using Facelets, create a project with Facelets based on version 1.2 of the JSF Reference Implementation, i. e. select the JSF 1.2 with Facelets option in the JSF Environment section of the New JSF Project wizard. The following table lists the templates that can be used with Facelets for any JSF project, and gives a detailed description for each one. Some servers already provide JSF libs and you risk library conflicts while deploying your project. To avoid such conflicts, use a template without libs if you have a server with its own JSF libraries. A sample application with Facelets that is ready to run. A sample application without libraries. 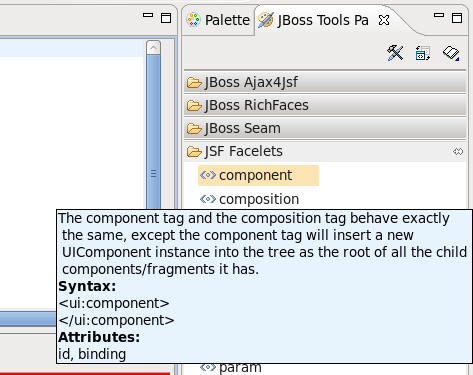 The JBoss Tools Palette comes with the Facelets components ready to use. A useful tip appears when you hover the mouse cursor over the tag; this tip includes a detailed description of the tag component, the syntax and available attributes. 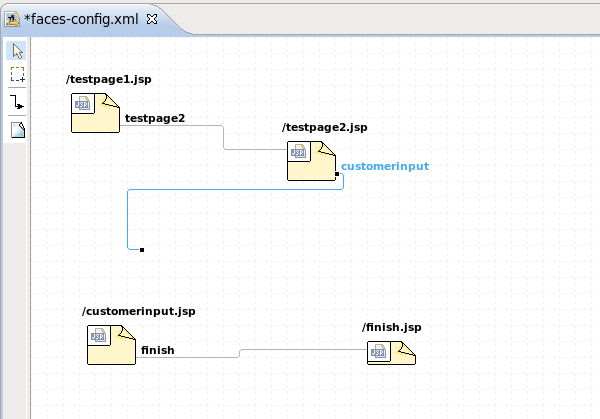 JSF Tools provides Facelets code assistance, which can be accessed by pressing Ctrl+Space. It is available for Facelets tags while editing .xhtml files. 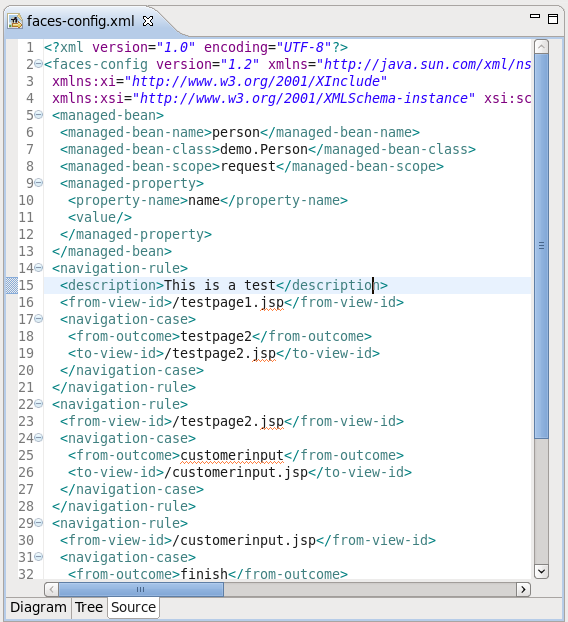 Code assist is also available for jsfc attributes in any HTML tag. 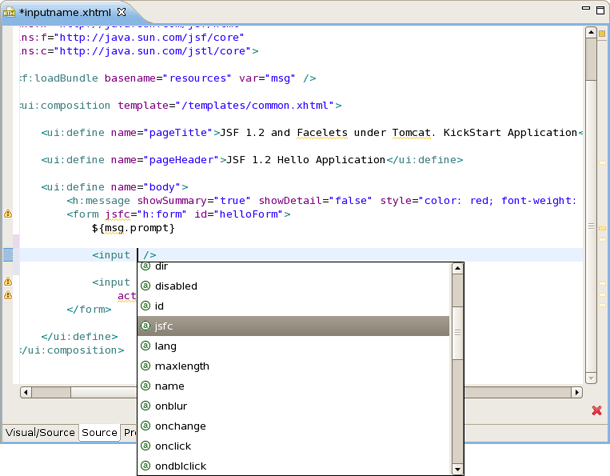 After selecting an jsfc attribute, the code assist feature will list the JSF components available on a page. When a component is selected you will see all available attributes for it. 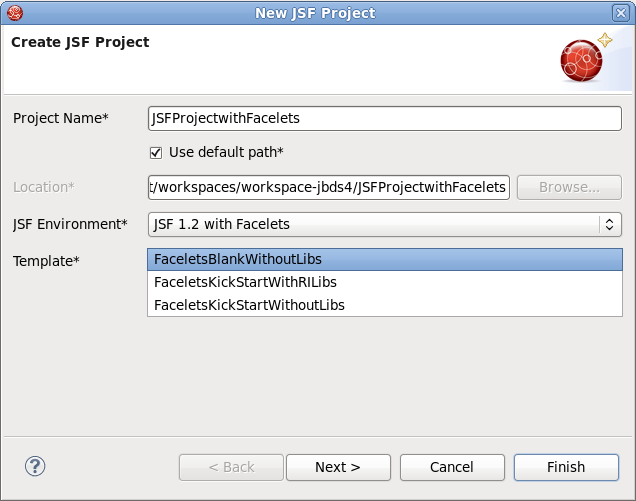 Finally, JSF Tools supports Eclipse's OpenOn™ feature while editing Facelets files. Using this feature, you can easily navigate between the Facelets templates and other parts of your projects. By holding down the Ctrl key while hovering the mouse cursor over a reference to a template, the reference becomes a hyperlink to navigate to that template. 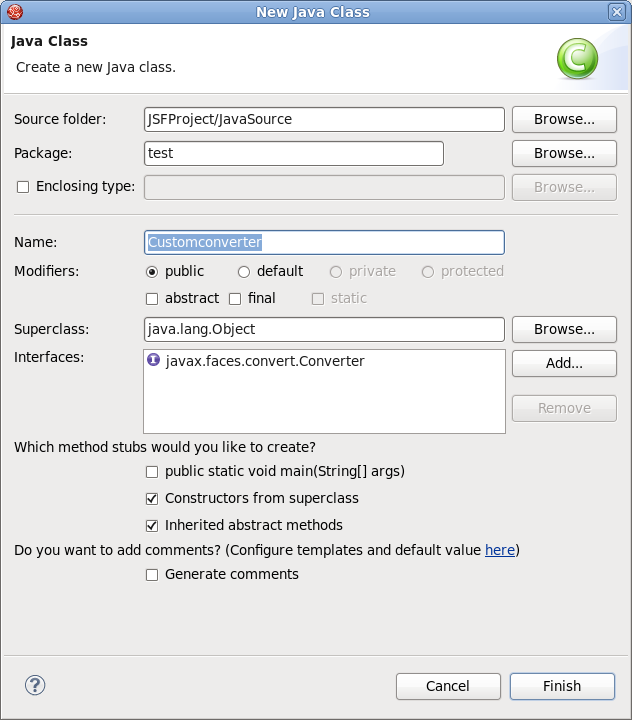 Import and add JSF capability to any existing project created outside Eclipse. This section will go into more detail for each step. It is easy to create a new project that contains all the JSF libraries, tag libraries and JSF configuration file with the aid of a special wizard. 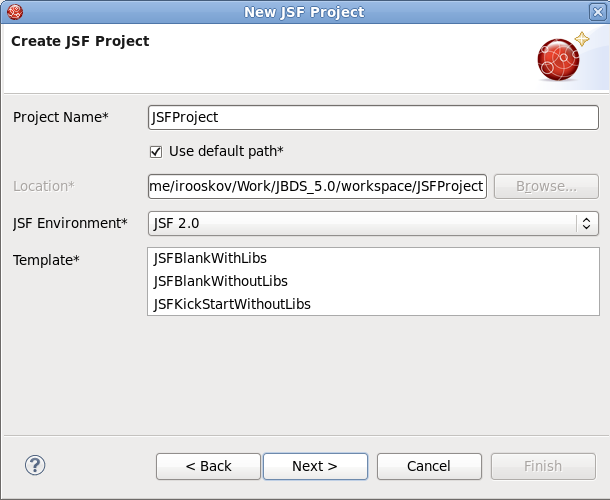 To get it, select File → New → Other → JBoos Tools Web → JSF → JSF Project and click the Next button. On the next page you will be prompted to enter the Project Name and select a location for the project (or just leave a default path). 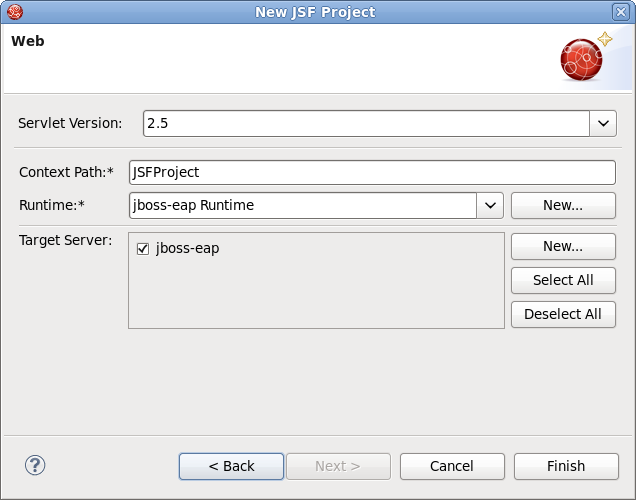 The JSF Version option also allows you to specify the JSF implementation to use. There are a number of predefined project templates that are both flexible and easily customizable. You can pick a different template on which the projects Importing Existing should be based on. Almost all templates come in two variations: with and without JSF libraries. 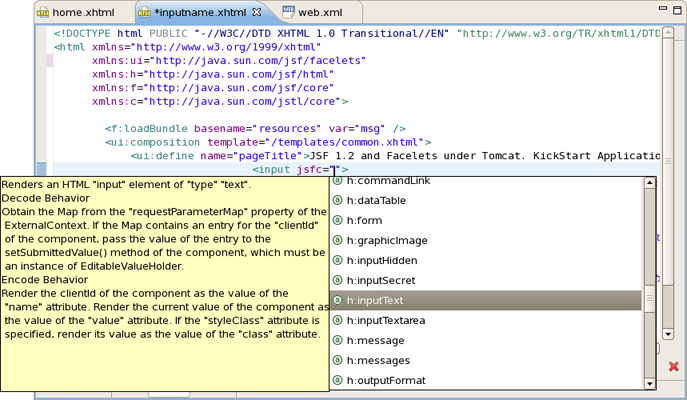 The table below provides description for each possible JSF template. 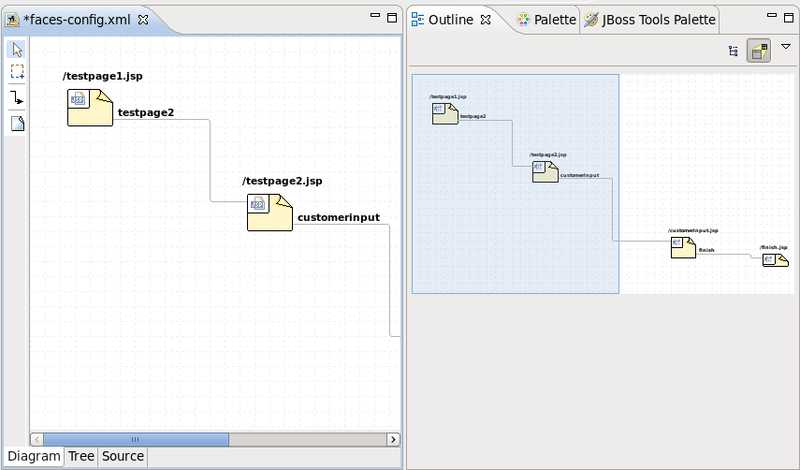 This template will create a standard Web project structure with all the JSF capabilities. Use a template without libs to avoid library conflicts when your server already has JSF libraries installed. This template will create a standard Web project structure, and also include a sample application that is ready to run. On the next page you need to select which Servlet version to use, and specify whether or not to register this application with JBoss AS (or other server) in order to run and test your application. 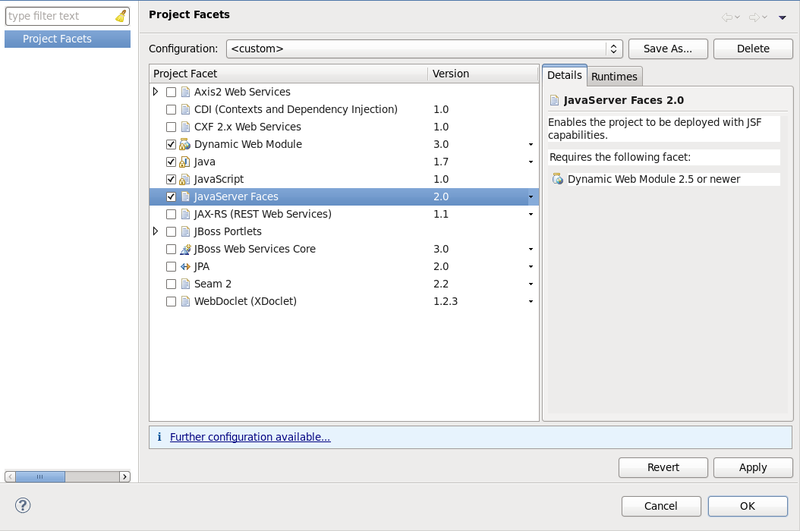 The Context Path option defines the name under which the application will be deployed. 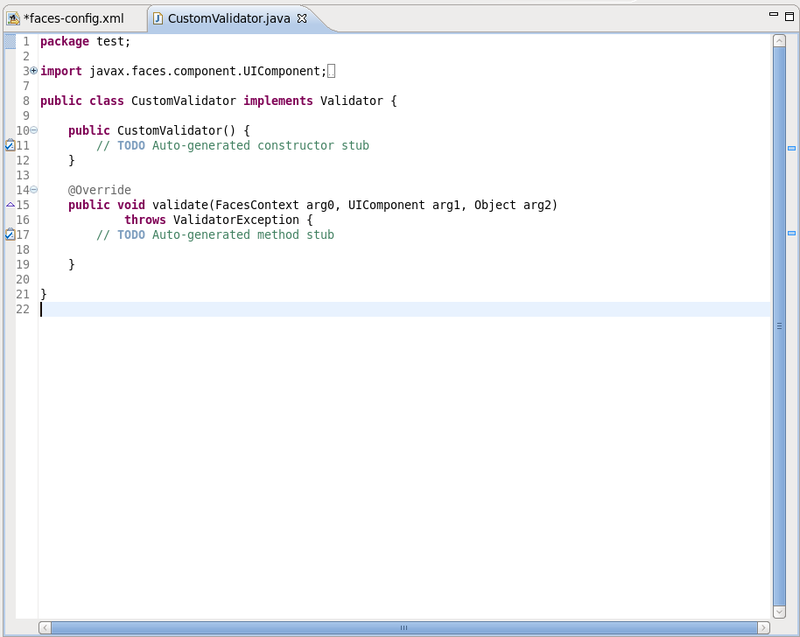 The Runtime value tells Eclipse where to find the Web libraries necessary to build (compile) the project. It is not possible to finish the project creation without selecting a Runtime. If you do not have any values, click the New... button to add new Runtime. The Target Server option allows you specifying whether or not to deploy the application. The Target Server corresponds to the Runtime value selected above. If you do not want to deploy the application, uncheck this option. At this point you can open the faces-config.xml file and start working on your application. 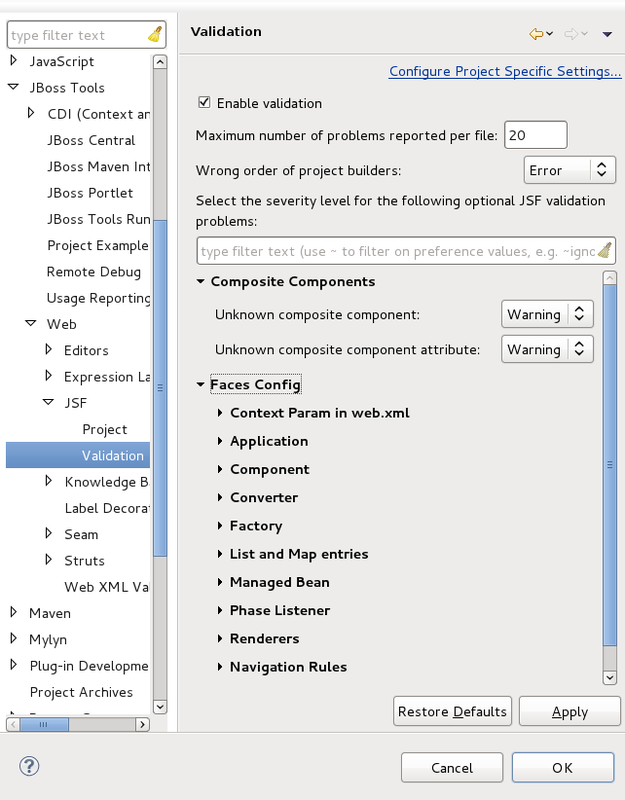 There are a lot of features available when developing JSF applications. These features will be discussed in more detail later in this document. 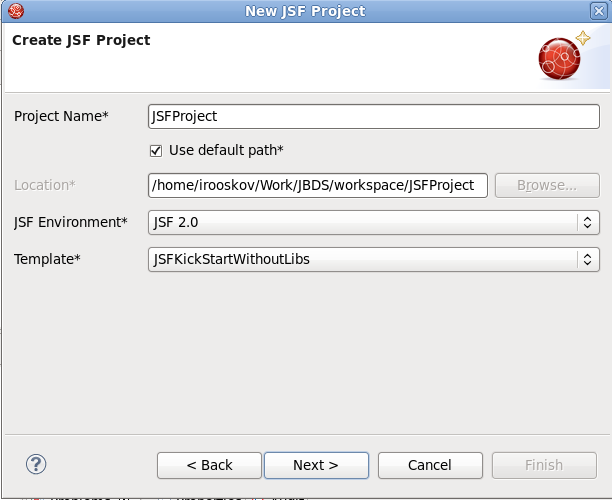 For detailed information on migration of JSF projects into a workspace see the Migration Guide. 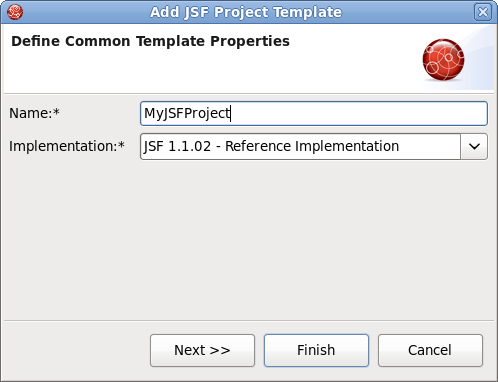 It is also possible to add JSF™ capabilities (JSF libraries, tag libraries) to any existing project in your workspace. 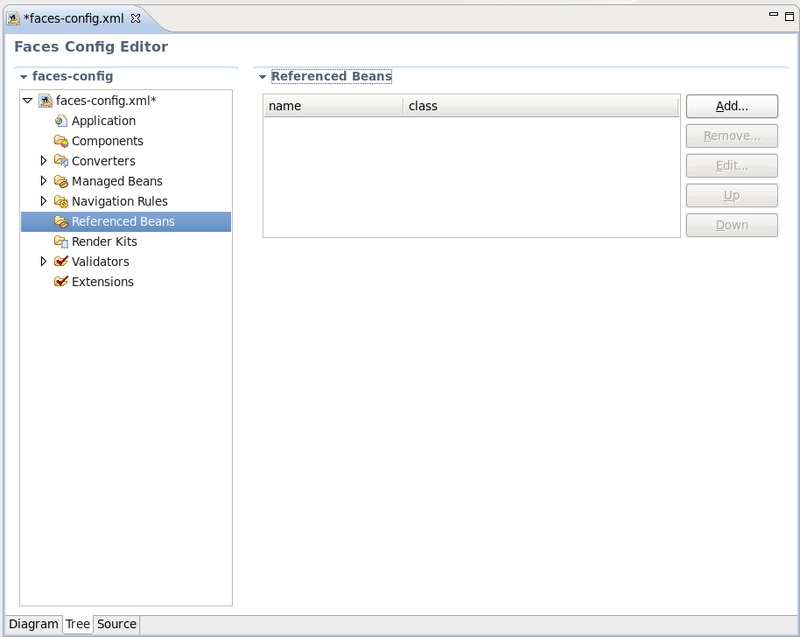 After that you will be able to make use of features such as the JSF configuration editor, JBoss Tools JSP editor and any others. No pre-existing web.xml file is necessary. 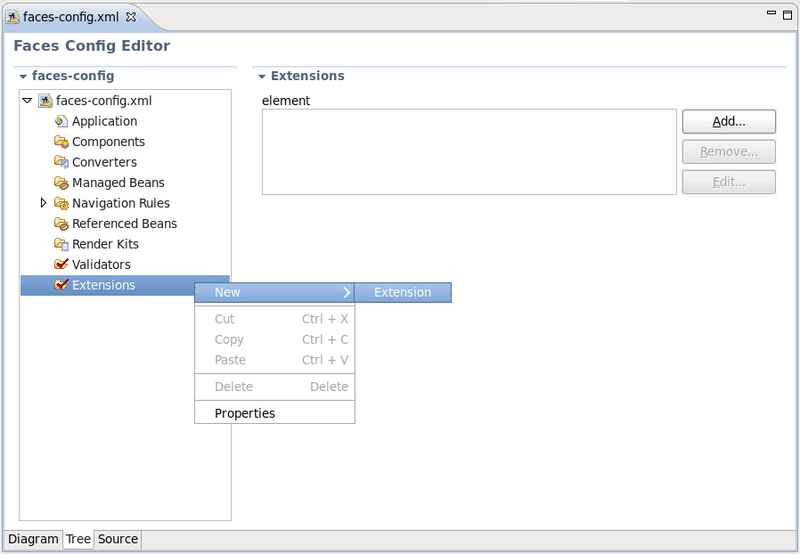 Right-click on the project in the Project Explorer, bringing up the context menu. 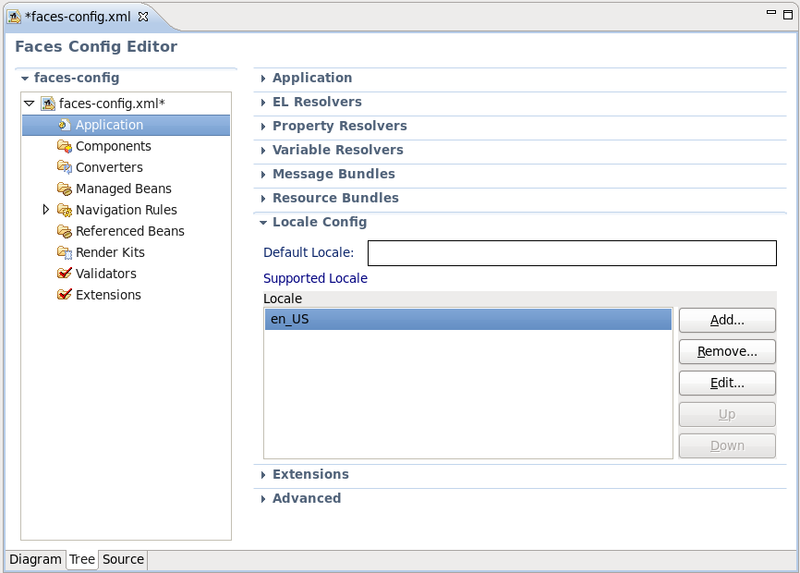 From this menu navigate to Configure → Add JSF Capabilities. This will open the Project Facets dialog for the project. Click the checkbox next to JavaServer Faces. 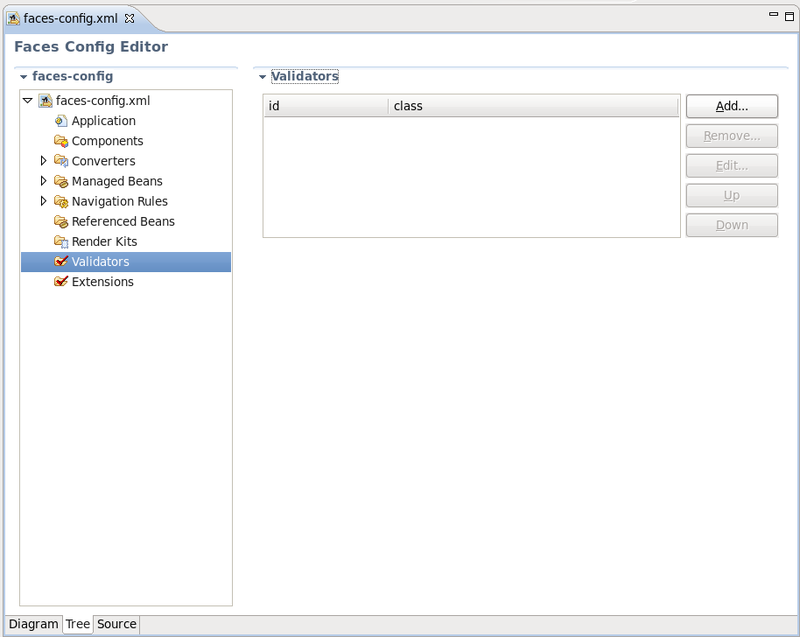 You undertake further configuration by clicking the Further configuration available button at the bottom of the dialog; this will allow you to define specific configuration options. Click Apply and then the OK on the Project Facets dialog when you are finished. The project will now contain a new node (visible through the Project Explorer) named Web Resources.You will also notice new files within the WebContent folder. Some application servers provide their own JSF implementation libraries. To avoid conflicts you should not add JSF libraries while adding JSF capabilities. 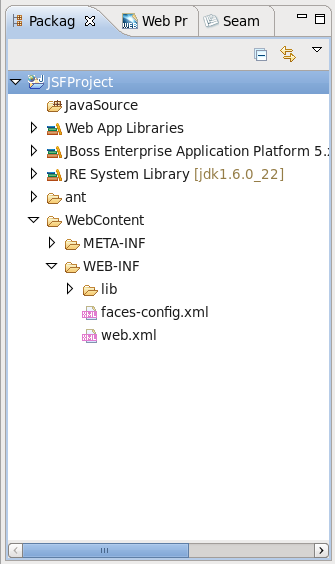 You can now open the new faces-config.xml file, that is found under your projects WebContent → WEB-INF folder. 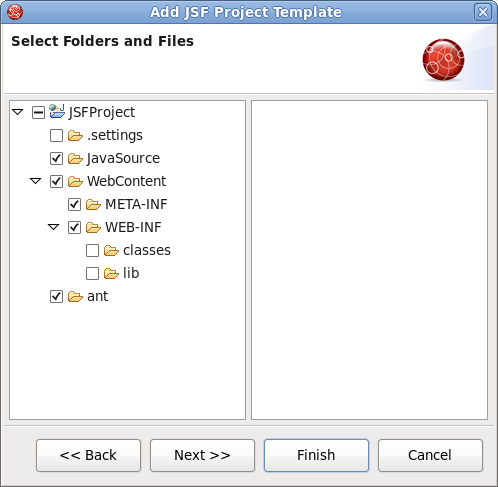 This file can be opened in a unique editor (see Chapter 5, JSF Configuration File Editor). A template is a set of files that is provided as a basis when creating a new project. Project templates provide content and structure for a project. JSF Tools provides powerful template capabilities which allow you to create new templates and import existing Struts and JSF projects. This templating facility has a variety of aspects to consider. Let's start with the most straightforward case and consider the process of creating a template from your existing JSF project. In the first dialog box, you can specify a name for the template (it will default to the project name) and confirm what run-time implementation of the project technology will be used. When you click the Next button a dialog box will be presented with your project structure displayed, along with a number of check boxes. Here you can select only those parts and files in your project directory that should be part of the template. At this point, unless you want to designate some extra files as having Velocity template coding inside them, you should click the Finish button. That's it. This template can be used with any new or imported project that uses the same run-time implementation as the project you turned into a template. At this point you have a fully configured project. 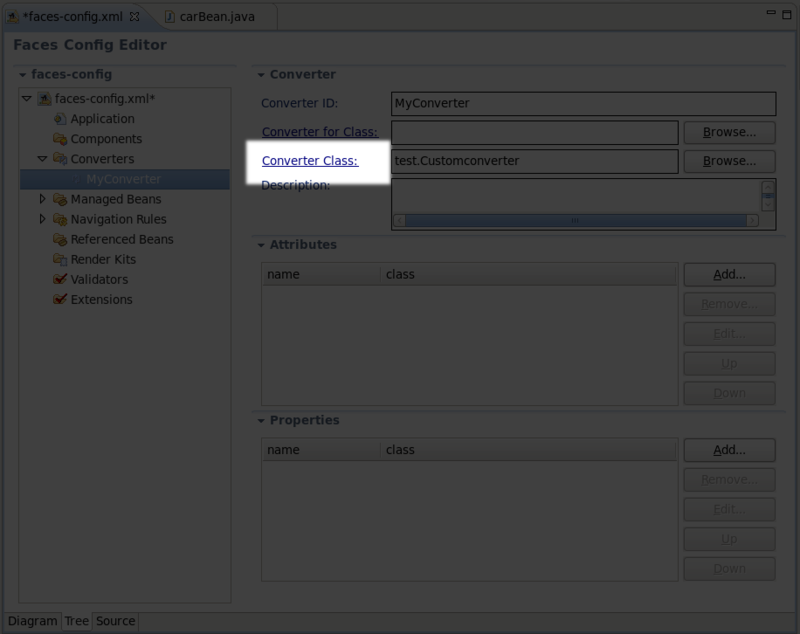 Now you can add some additional logic to it starting with the JSF configuration file. You can find a more in-depth explanation on how to work with the special wizards, editors and views that can be used while developing JSF applications in our Visual Web Tools Guide. The web.xml file inside the WEB-INF folder is a deployment descriptor file for a Web Application. It describes the servlets and other components and deployment properties that make up your application. 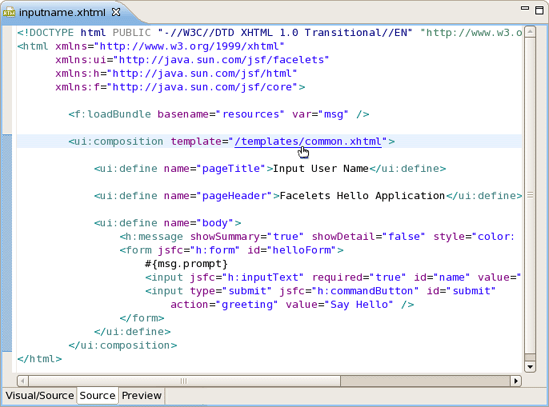 JBoss Tools add the web.xml file to created JSF project automatically and provides a special editor for its editing. See the Visual Web Tools guide for more information on the web.xml editor. First, we should mention that JSF configuration file (faces-config.xml) is intended for registering JSF application resources such as Converters, Validators, Managed Beans and page-to-page navigation rules. They can be selected via the tabs at the bottom of the editor. 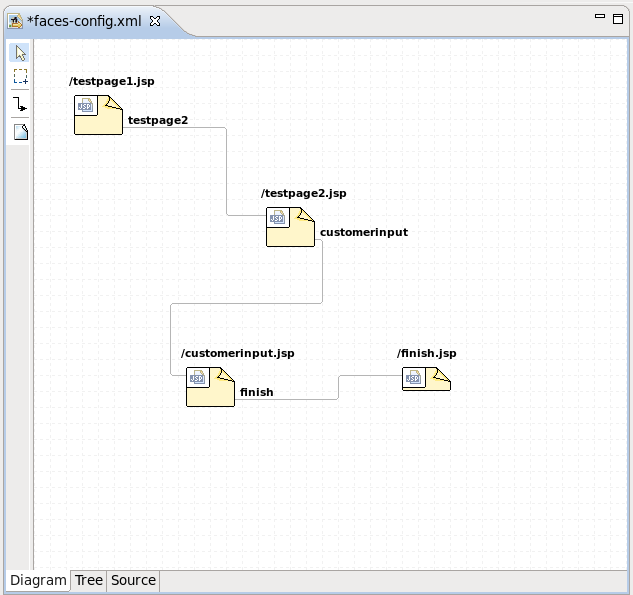 Here, we will show you how to work with JSF configuration file through the Diagram view of the editor. To create a new page here, you should click the page icon (View Template) on the toolbar from the left and then click anywhere on the diagram. A New Page Wizard will appear. Select the transition icon from the toolbar (New Connection). It is also possible to create a new page with context menu by right-clicking anywhere on the diagram and selecting the New View... option. You can find it more convenient to edit your JSF Configuration file in the Tree view of the VPE. 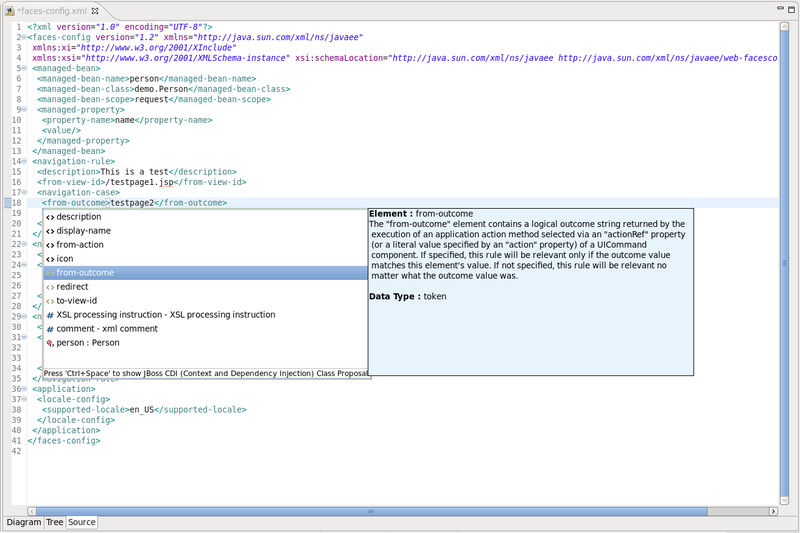 The view displays all JSF application artifacts referenced in the configuration file in a tree format. By selecting any node on the left, you can view and edit its properties which will appear in the right-hand area. Let's look at the structure of this tree more closely. Under the Application node you can adjust JSF application specific settings such as internationalization, extensions, adding property and variable resolvers, etc. 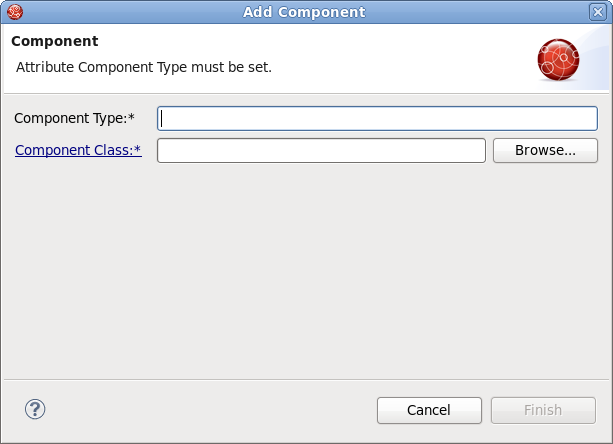 The Components node is for registering custom JSF components. Right-click and select New → Component or just click the Add button in the right-hand area to add a new component to the JSF Configuration file. In the Add Component wizard you should set a component type and point to a component class by using the Browse button or create a new class for this component by using the Component-Class link. 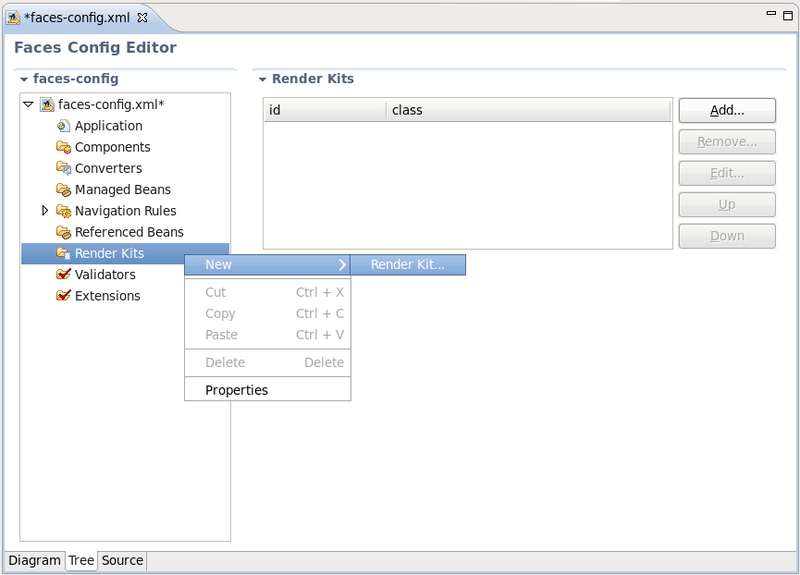 Use the Render Kit node to create and register a set of related renderers for custom JSF components. Under the Converters node you can create a converter class for your JSF application either with an id or for a proper class. For more information on this procedure see Section 7.1, “Create and Register a Custom Converter”. 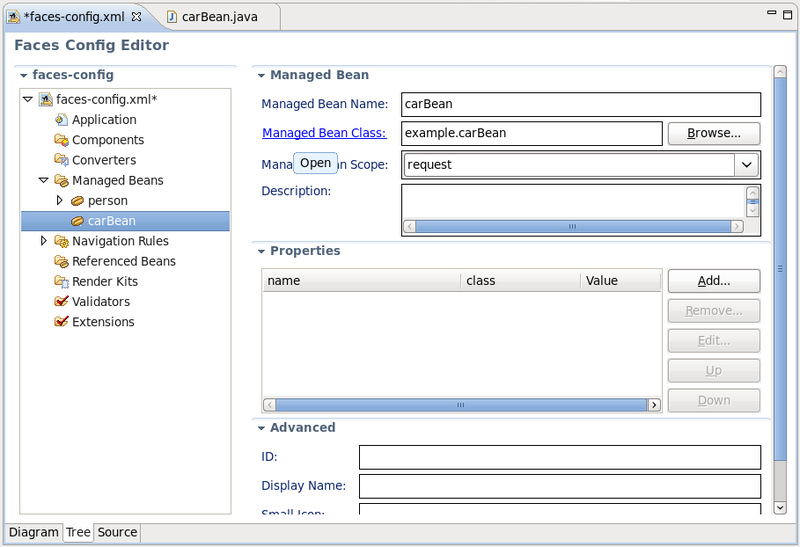 The Managed Bean node allows you to create and register Bean classes in your JSF application. Read more on the topic in Chapter 6, Managed Beans. Use the Navigation Rules node to configure a navigation between the pages in your application. Here you can create a new navigation rule and adjust necessary properties for it in the right-hand area. 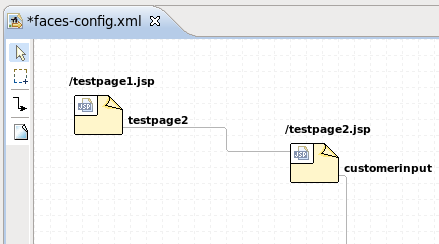 The same you can do in the Diagram view of the JSF Configuration file editor (see Section 5.1, “Diagram view”). 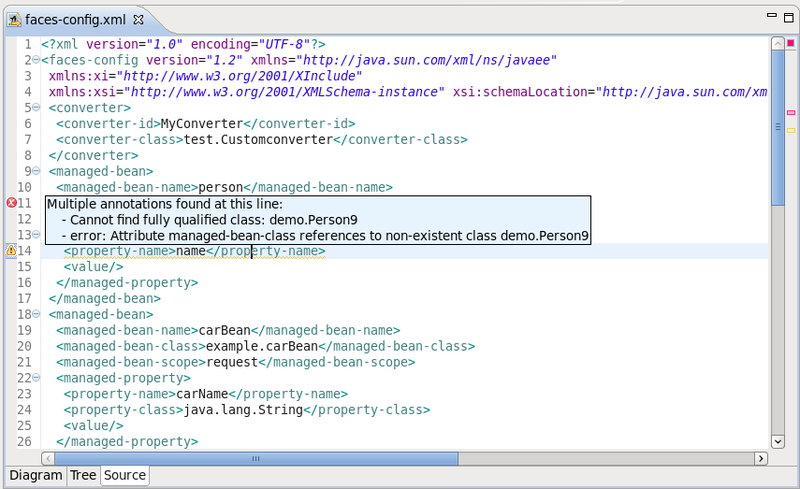 Under the Referenced Beans node you can add a new Referenced Bean and configure various properties for it. To learn more on this refer to Section 7.3, “Create and Register Referenced Beans”. The Validators node is needed to create validator classes for organizing the validation of your application data. You can read more on the topic in Section 7.2, “Create and Register a Custom Validator”. The Extensions node is for setting extensions in your faces-config.xml file. 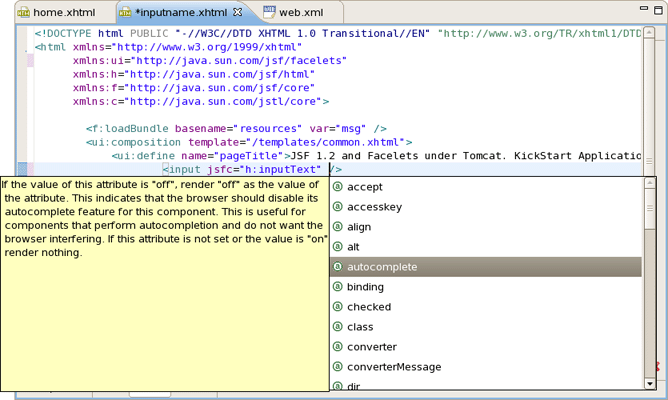 Here, we'll discuss how you can configure your faces-config.xml file with the help of the Source View. You can also work in the Source View with the help of the Outline View. 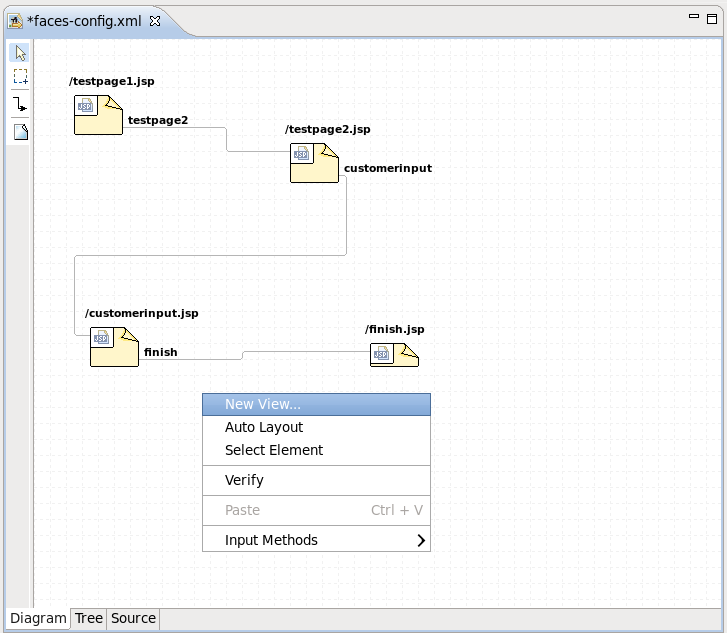 The Outline view shows a tree structure of the JSF configuration file. Simply select any element in the Outline View, and it will jump to the same place in the Source editor, so you can navigate through the source code with Outline View. Here we'll discuss a very important features that JSF configuration file editor provides when working with JSF resources. 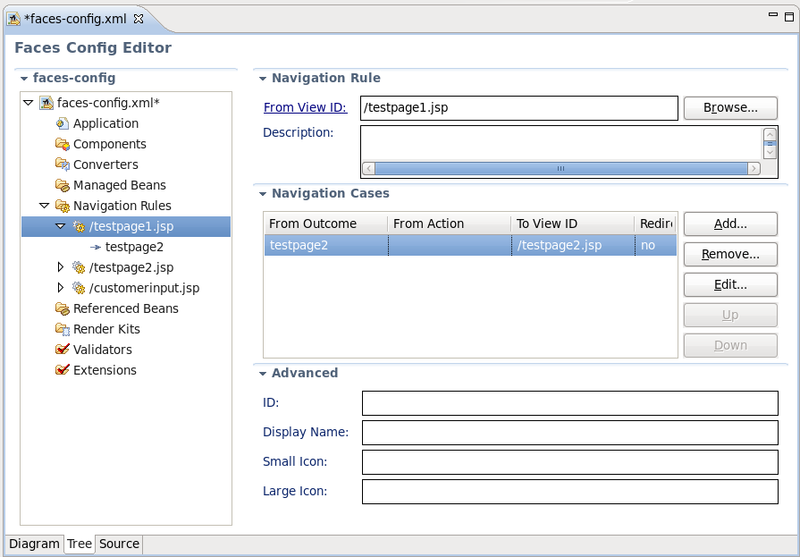 The JSF configuration file editor comes with the very useful OpenOn navigation feature. You can find more information on this feature in the Visual Web Tools Reference Guide. Code Assist provides a pop-up tip to help you complete your code statements. It allows you to write your code faster and with more accuracy. Constant error checking is provided while you are developing your project. This greatly reduces your development time as it allows you to catch many errors during the development process. Other errors are also reported. This guide will look at each of these features in more detail. 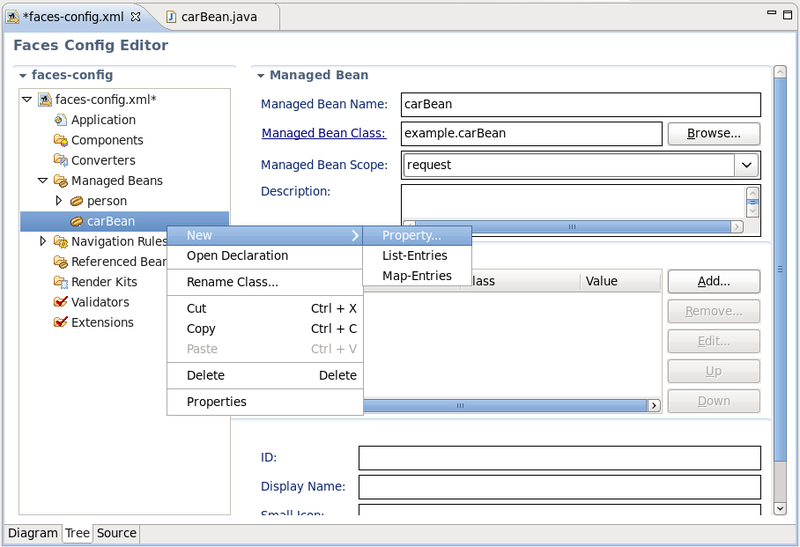 To begin, create a new managed bean in JSF configuration file editor using the Tree view. 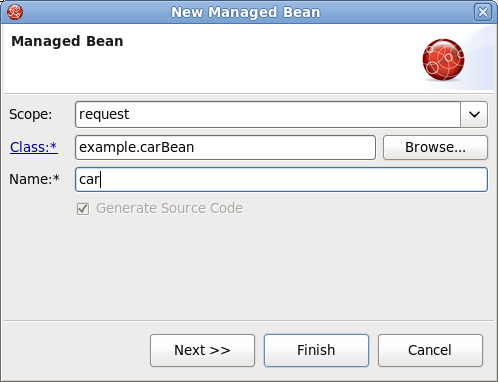 When you define a new managed bean, make sure that Generate Source Code option is checked as shown in the figure below. 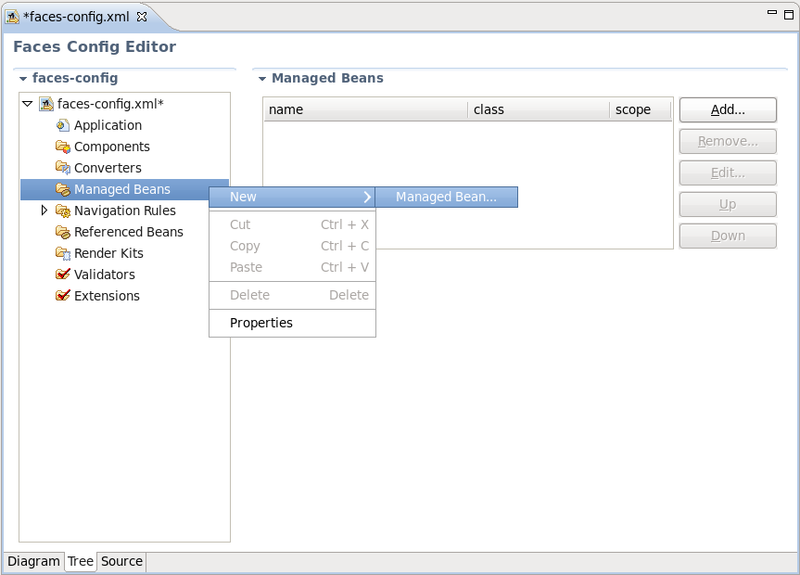 Click on the Managed-Bean-Class link in the editor. 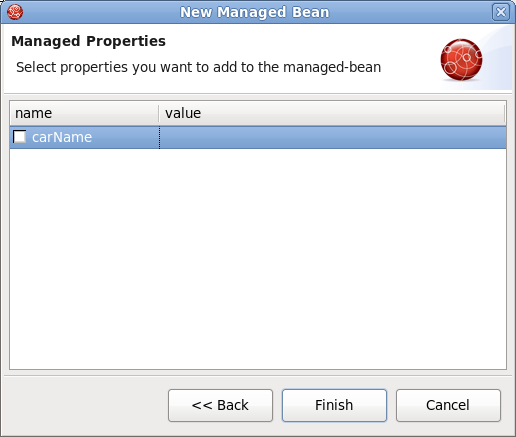 Right click the managed bean and select the Open Declaration option. You can also generate source code for properties, also includes getter and setter methods. Right click on the bean and select New → Property. You will then see the Add Property dialog. This covers the options available when creating a new Managed Bean. 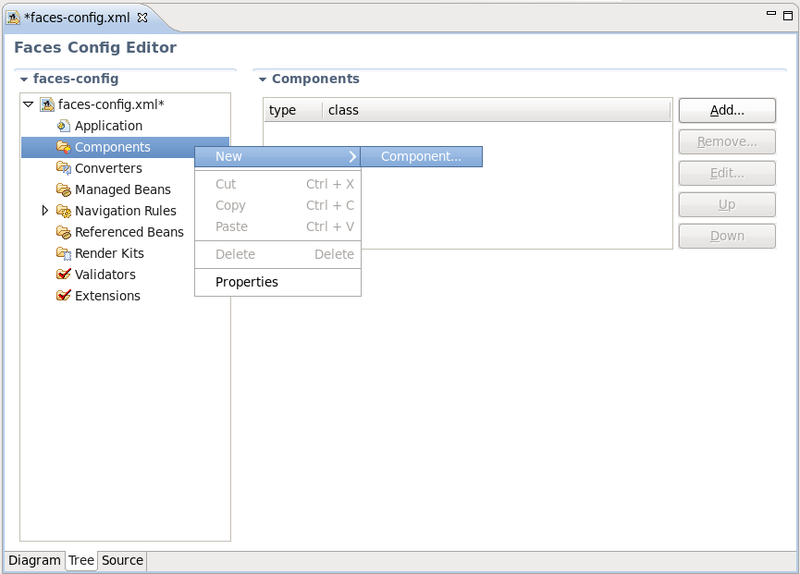 The next section will show you how to add an existing Bean into a JSF configuration file. 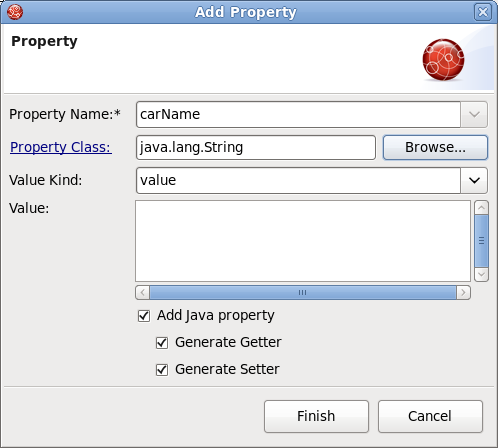 If you already have a Java bean you can easily add it to a JSF configuration file. You should start the same way you create a new managed bean. 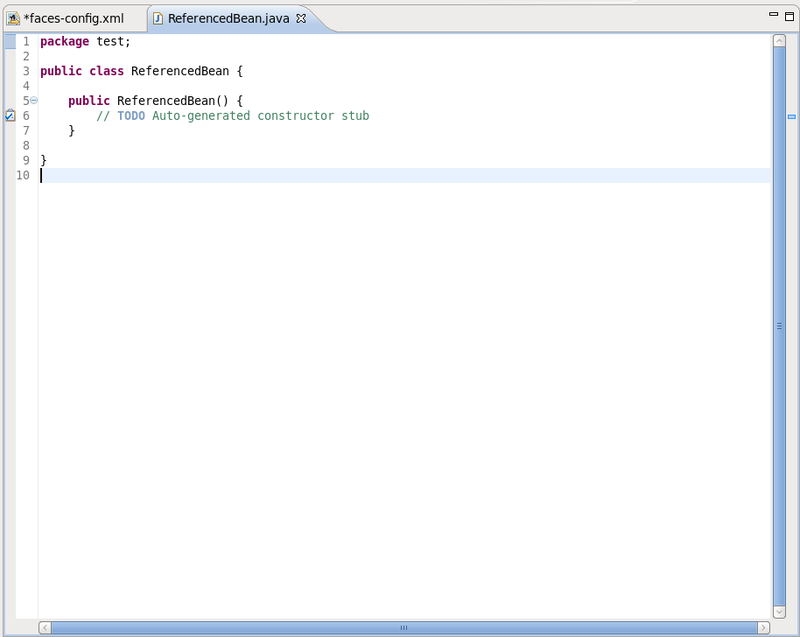 Use the Browse... button to add your existing Java class. Once the class is set, its Name will be set as well. But you can easily substitute it for the other one. 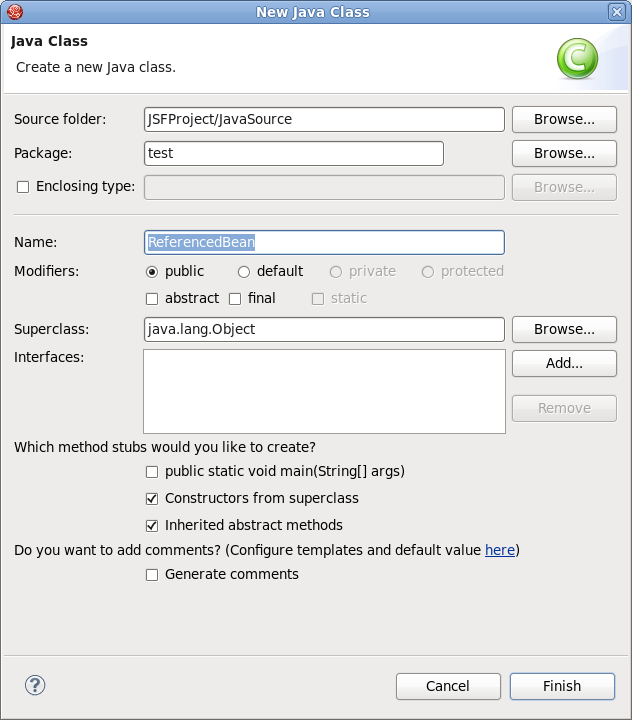 Notice that Generate Source Code option is not available as the Java class already exists. After adding your class the Next button will be activated. When you click it you will be presented with the Managed Properties dialog where all corresponding properties are displayed. Checking the appropriate ones will add them into your JSF Configuration File. Figure 6.9. Selection of Bean's Properties. If you don't want to add any, just click the Finish button. 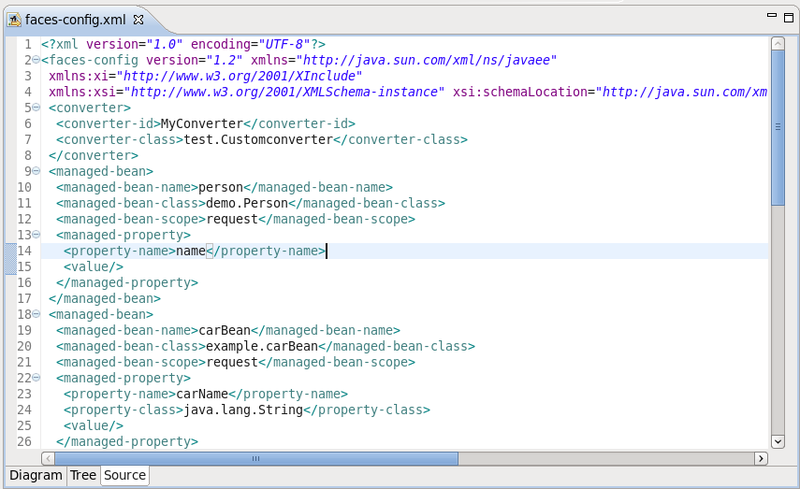 The steps above have demonstrated how you can add an existing Bean to the JSF configuration file, i.e. faces-config.xml. The next chapter will demonstrate how to organize and register other kinds of artifacts. 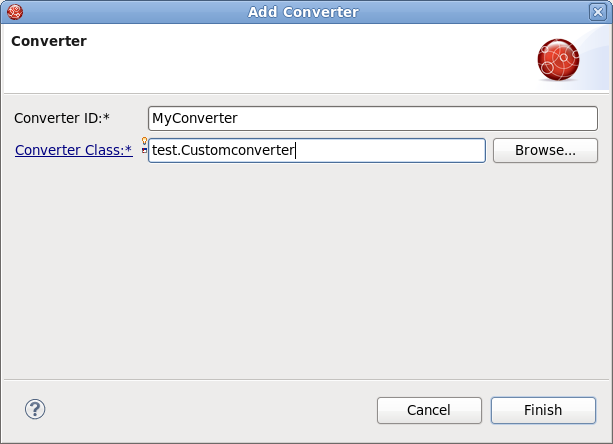 It's also possible to create a custom Converter in order to specify your own converting rules. Let's look at how you can do this. 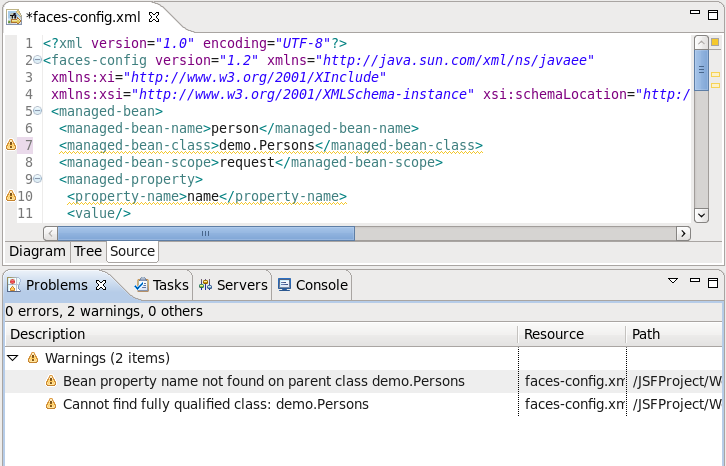 In the Project Explorer view open the faces-config.xml file and select Tree tab. Select Converters and click the Add button. 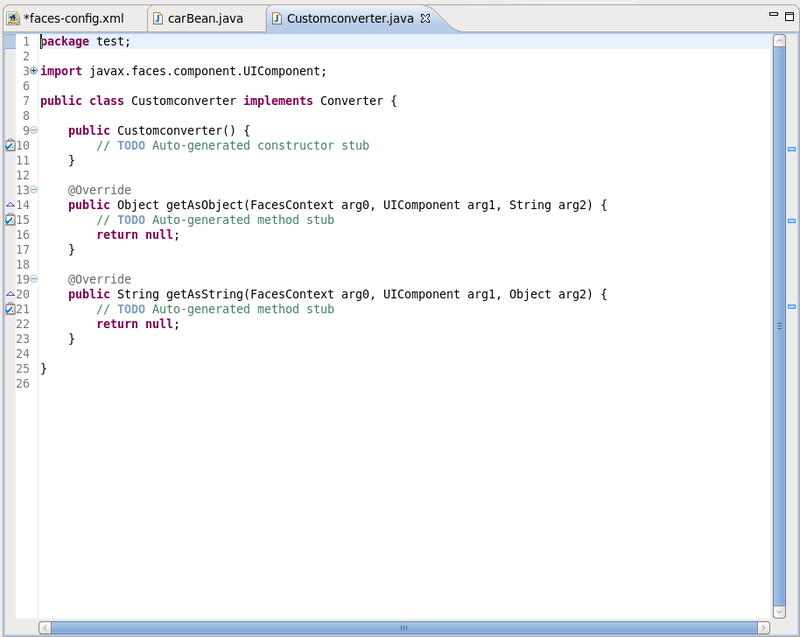 On the form type the name of your converter in the Converter-id field and name of the class for converters. After clicking Finish button your custom converter is registered under the entered name. 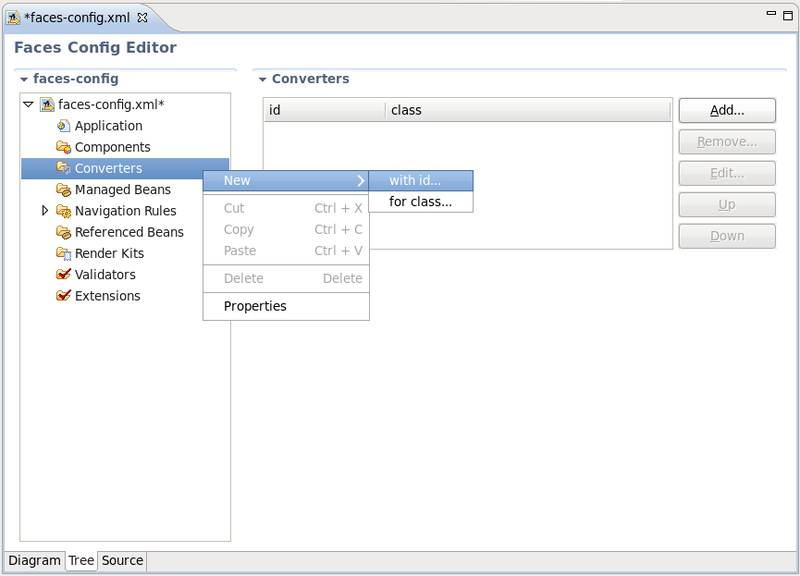 Now you can create a "converter" class. In the Converter section you should see your Converter-id and Converter-class. Click on the Converter-Class link to generate the source code. A usual wizard for creating a Java class will appear. All needed fields here will be adjusted automatically. Just leave everything without changes and click the Finish button. To open a converter class click again on the Converter-Class link in the Converter section. 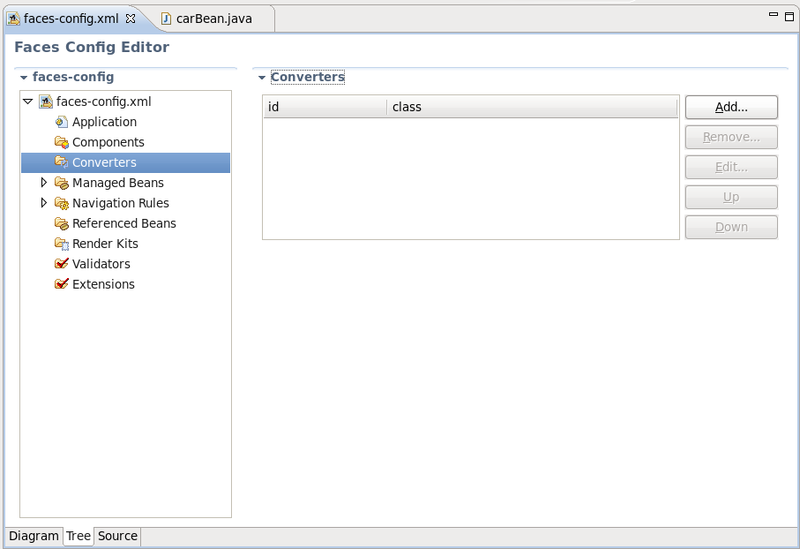 Now you are able to add a business logic of converter in the Java editor. 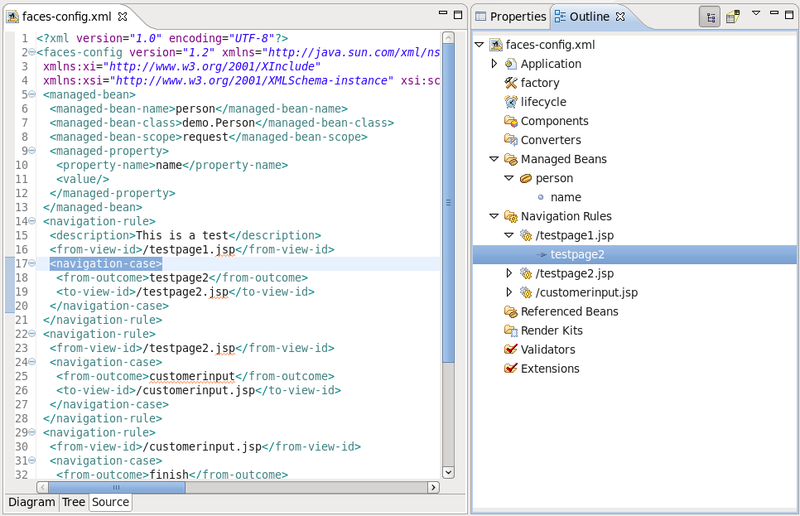 In the Project Explorer view open the faces-config.xml and select the Tree tab. Select the Validators option and click the Add button. 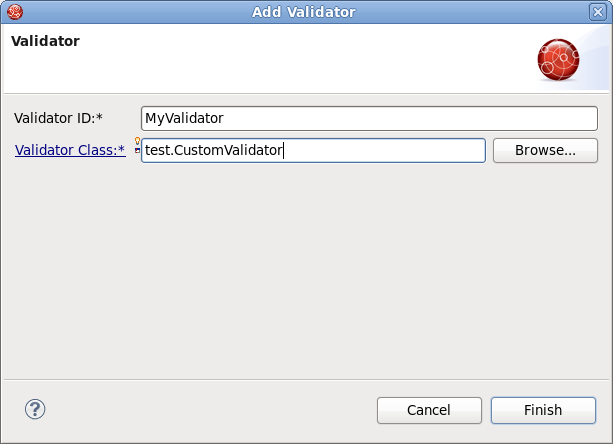 Type the name of your validator in the Validator-id field and name of the class for validators. After clicking the Finish button your custom validator is registered under the entered name. Now you can create the "validator" class. 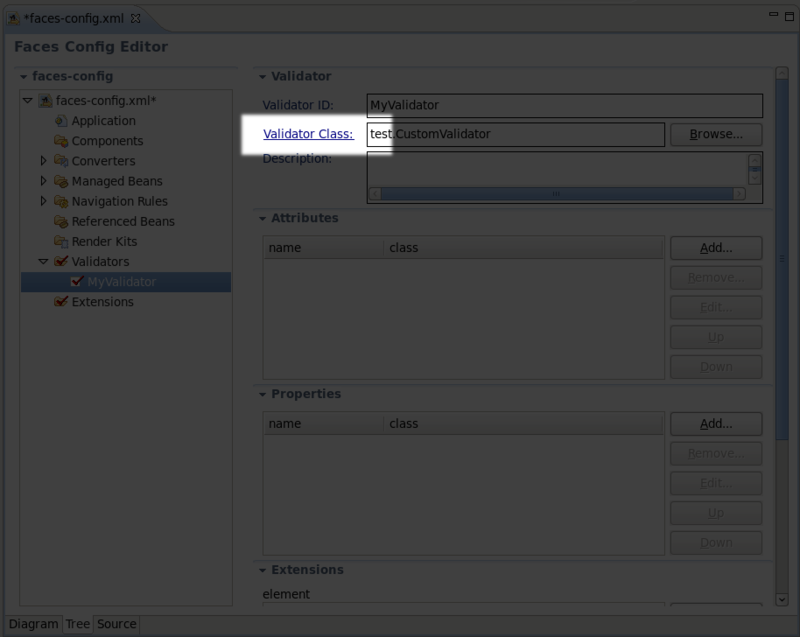 In the Validator section you can see your Validator-id and Validator-class. To generate the source code click on Validator-class. 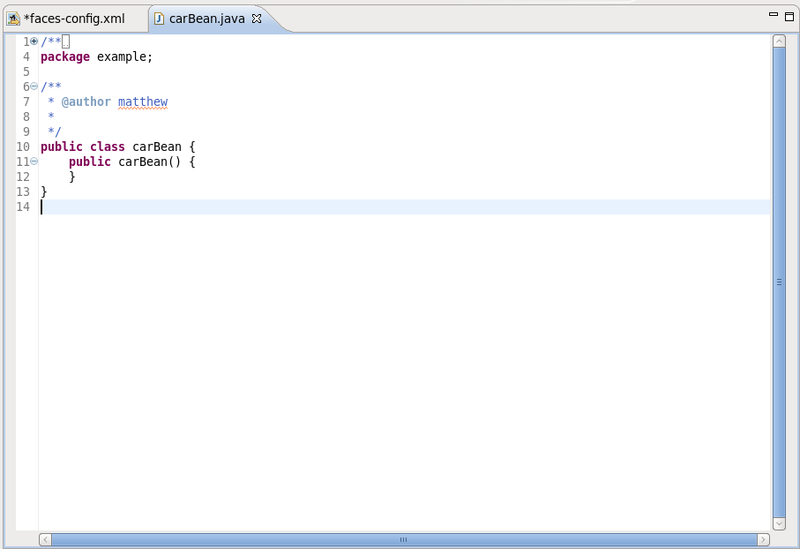 Java class will be created automatically. Leave everything without changes and click the Finish. To open the validator class click on the Validator-Class link in the Validator section. 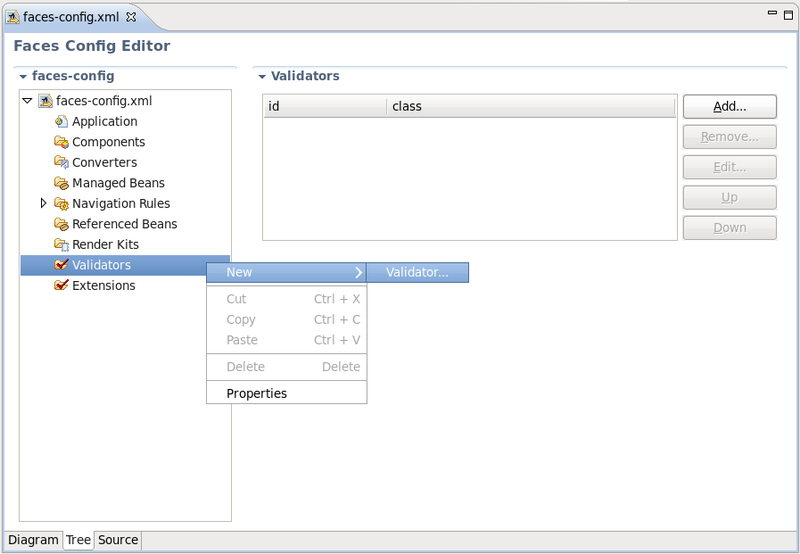 Now you are able to write a business logic of validator in the Java editor. 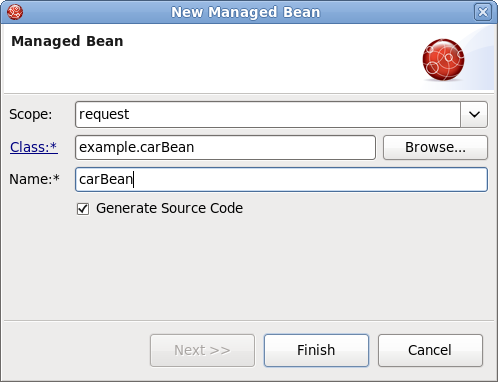 The creation of Referenced Beans is similar to the creation of Custom Validators. The steps below show you the steps required to create Referenced Beans. 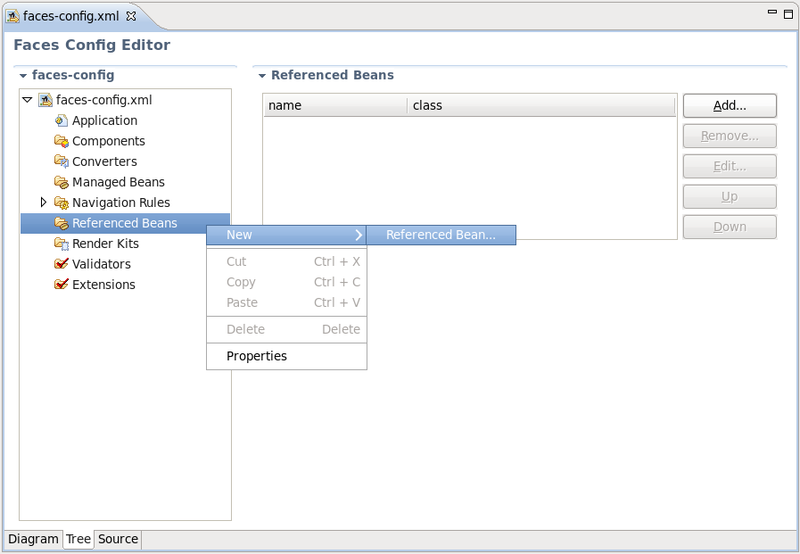 Select the Referenced Beans option and click on the Add button. 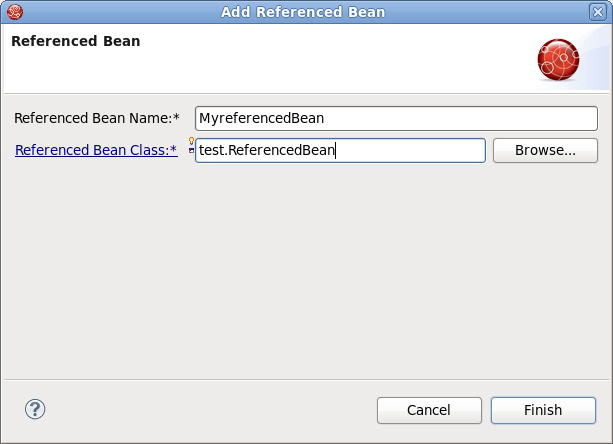 Type in the name of your Referenced Bean and type in or select the Referenced-Bean-Class value by clicking the Browse button. 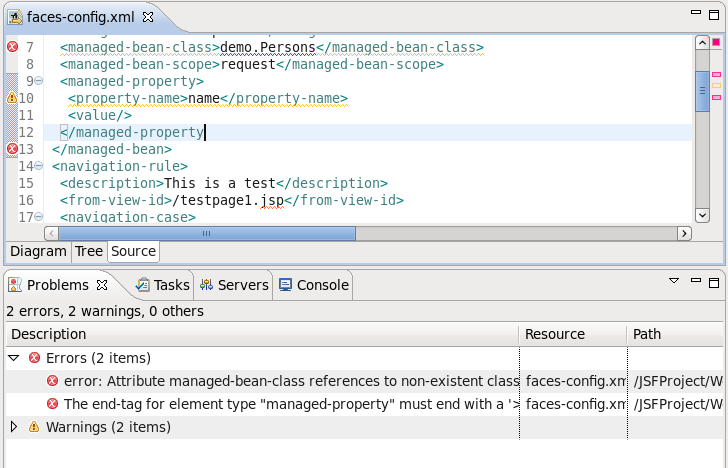 In the Referenced Bean section you should see your Referenced-Bean-Name and Referenced-Bean-Class. 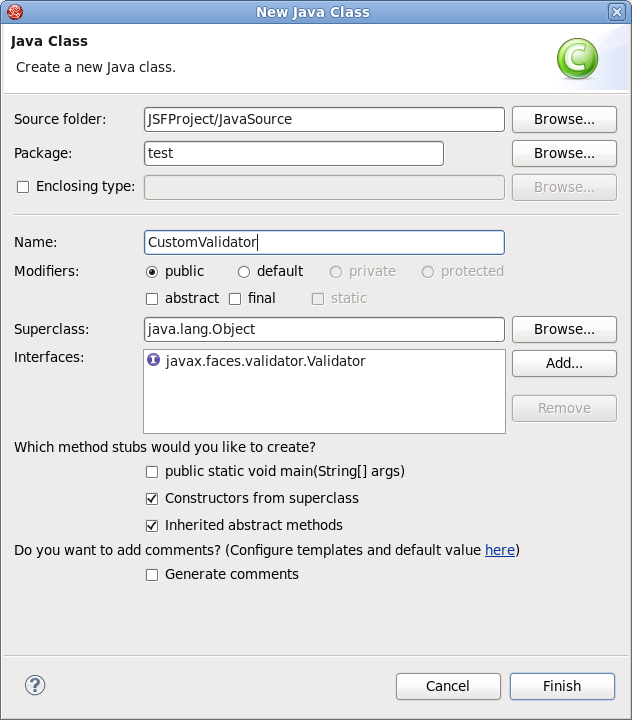 Click on the link to open the Java creation wizard. 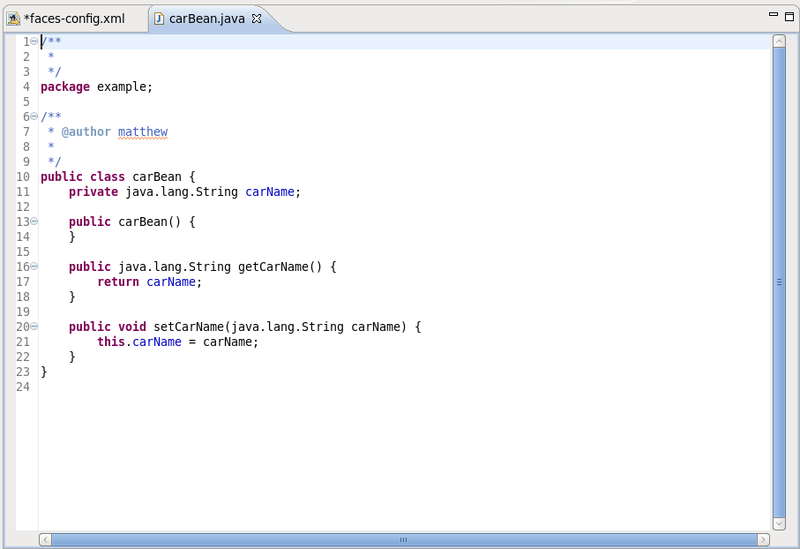 The Java class will be created automatically. Leave everything with their default values and click the Finish button. 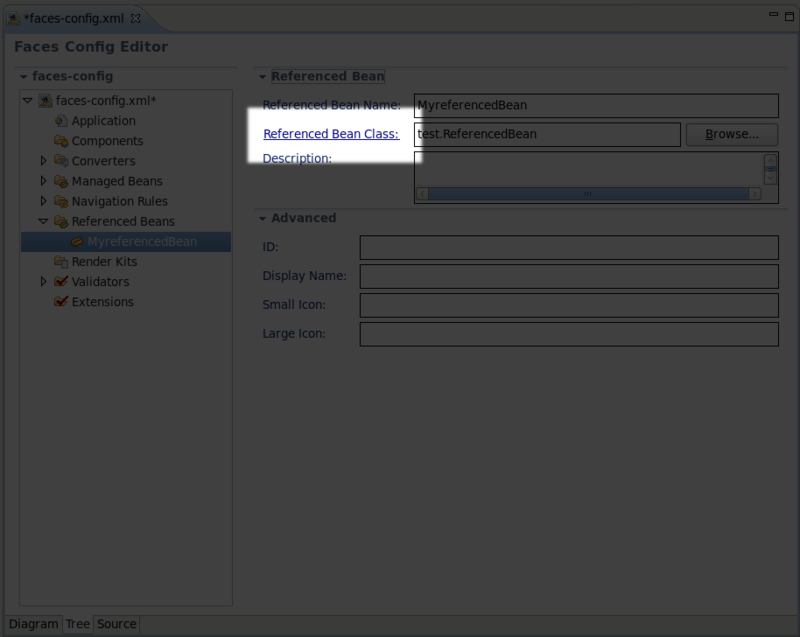 To open a Referenced Bean class click the Referenced-Bean-Class in the Referenced Bean section. 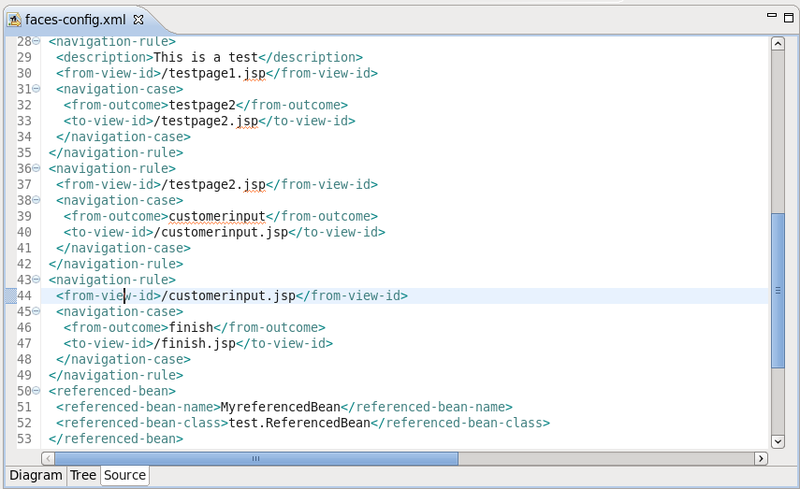 Now you are able to write business logic of Referenced Bean in the Java editor. In this chapter we'll discuss a possible verification that you can take advantage of. Many different rules are checked for a JSF project that can be configured by selecting Window → Preferences from the menu bar, selecting JBoss Tools → Web → JSF → Validation. Notice that the Package Explorer View shows a marked folder and a marked file where the error is. In summary, this document highlights all the JSF-specific features of JBoss Tools meant for enhancing the development of rich Web applications based on JSF technology. The reference introduces you to wizards for creating and importing JSF projects, JSF Configuration File editor features, functionality for enabling JSF capabilities and etc.